Ernakulam gets its name from the Ernakulathappan Temple in this town. The temple is dedicated to Lord Shiva and Ernakulathappan literally means Lord of Ernakulam. The present temple is the one rebuilt in 1842 over the old remains of the ancient temple. In addition to communities such as Hindus, Muslims and Christians, minorities such as the Buddhists, the Jains, the Sikhs, and the Jews also form part of the cosmopolitan population. The ancestors of the Jews migrated from Jerusalem in 72 A.D. Now there are very few Jewish families in Cochin. There are lots of old Siva Temples in Ernakulam. People have been worshiping lord Shiva for over 5000 years. In Sanskrit "Siva" means kalyan (good wishes, doing good and taking care of all). So as part of this universal brotherhood though People are used to celebrate MahaSivaratri, it comes in Month of Maha before two days of Black moon. For this day people are doing lots of preparation. On that day people are used to keep full days fasting and Doing puja for Universal Peace and Asking enery for destroys evils things. Kallil Kshethram(Jain Temple) near Perumabavoor is also very famous. Adi Shankaracharya was born in Kalady and considered as a major pilgrimage centre for Hindus around the world. Thrippakudam Temple- Ana Kallaya Kulam -PARVATHIMANGALAM is the famous pooja in this temple. Arayankavu Thookkam- Otta Thookkam and Garudan Thookkam is very famous.The festival at the church of Vallarpadam on September 24 attracts people belonging to all religions. The icon of Virgin Mary in this church is credited with many miracles. The world famous Christian pilgrim Center at Malayattoor is in this district. The festival here lasts for 10 days in April. St. George Church at Kadamattam is very old and was founded by Mar Abo Metropolitan in 5th Century A.D. He brought a cross from Persia, which is still preserved in the church.. St. George Forane Church at Edappally, which was founded in 593 A.D., is considered to be the oldest church in Kerala after the 7 churches founded by St. Thomas. St. Antony’s church at Kannamaly is famous for the Feast of St. Joseph on March 19 where a large number of people are fed.One of the ancient mosques in Kerala is at Kanjiramattam.Chandanakkudam Festival in Kanjiramattom Mousque is very famous. Cherai Pooram is famous festival in island. Celebrating this full moon day having two purpose. Fields are ready for cropping, Start cropping with prayers and some auspicious puja. Next reason is People are ready to go in to sea. So on this day women of India generally having fasting of full day and pray for her brothers, father, husband and Nation 's victory. Agriculture constitutes the most important segment of the district’s economy and it is the biggest source of employment. Of the geographical 235319 hectares, crops are grown in 210438 hectares. Coconut is the principal crop followed by rubber, paddy, and tapioca. A paddy cultivation system called pokkali is peculiar to the district. Ernakulam district is bestowed with all the geographical factors, which help the development of industry, and it is in the vanguard of all other districts in Kerala in the field of industry. The availability of all types of transport facilities viz., road, rail, canal, sea, air is a factor which is unique to this district. Ernakulam is perhaps the biggest commercial center in the state of Kerala. Its M.G. Road is the location of some of the biggest businesses in Kerala. By Air The nearest airport for Ernakulam is at Kochi(Nedumbassery). By Rail Ernakulam is a major railhead of the Southern Railway. By Road The district has excellent road connections. A little island on which the Dutch built their palace during their colonial reign, it also has a park and a golf course. The palace is today a heritage hotel, managed by the Kerala State Tourism Department. This beautiful man-made island is where you’d land if you were visiting Cochin in a cruise ship. It is surrounded by backwaters, is a link between West Cochin and Ernakulam and houses the Port and the country’s southern naval command. Built in 1568, this Synagogue is the oldest in India. 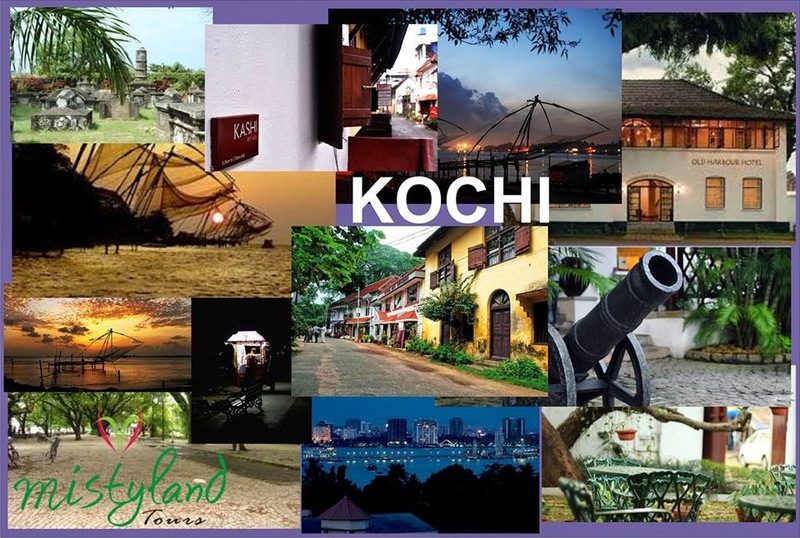 Fort Kochi is the where you will find the last remnants of the colonial era in Cochin. St. Francis Chruch, built by the Portuguese in 1503, stands here. The body of the Portuguese explorer, Vasco da Gama was first buried here. The famous Santa Cruz Cathedral is also at Fort Kochi. Chinese Fishing nets, which actually predate the colonial era, are another attraction of Fort Kochi. The erstwhile palace of the Kochi royal family is now Kerala's first ever heritage museum and an ethno-archaeological museum. The museum showcases oil paintings, murals, manuscripts, furniture, inscriptions and coins belonging to royal family. A Jain temple carved out of a single stone. It also has statue of Mahaveera. You could take a boat ride in the backwaters here, or you could just take a walk down this promenade in the evening to enjoy the sunset or to sip on a coffee from one of the many cafes lining it. The Chinese fishing nets (Cheena vala) of Fort Kochi are supposed to have originated from China, and hence the name. These shore-operated lift nets line many parts of the coast here. This palace was actually built by the Portuguese in 1568 before it was later renovated by the Dutch. It is now a museum that featuring Kerala murals depicting Hindu temple art, portraits and exhibits of the Rajas of Kochi. Kodanad is a beautiful rural riverside village with an Elephant training centre. It has become a popular tourist destination and is an Ecotourism destination project sponsored by the Government of India. Bhoothathankettu (literally ‘Fort of Spirits’) is situated about 50 km away from Ernakulam. It is a dam site with a scenic view of the forests. A myth connected with the origin of this place says that this natural fortification of forests and hills was built by Bhoothams (spirit/ghosts) overnight, which is why it is named so. This shrine is atop a hill that tens of thousands of pilgrims ascend every year during lent. The shrine is believed to date back to the time of the apostle Thomas, who is believed to have prayed upon this hillock.